Here's an easy way to help! Eye of the Storm is an equine rescue center in Stow, Massachusetts. Read all about us. Interested in helping? Read how you can help the horses. Email is not a good way to reach us, but someone might get to it eventually. While I've been working at EOTS for years – I also have my own 3 horses. Mine are rescues too, the littlest is a pony who is one of EOTS's rescues, then I have a small black draft mare, Tank, and a large Belgian draft, Revel. 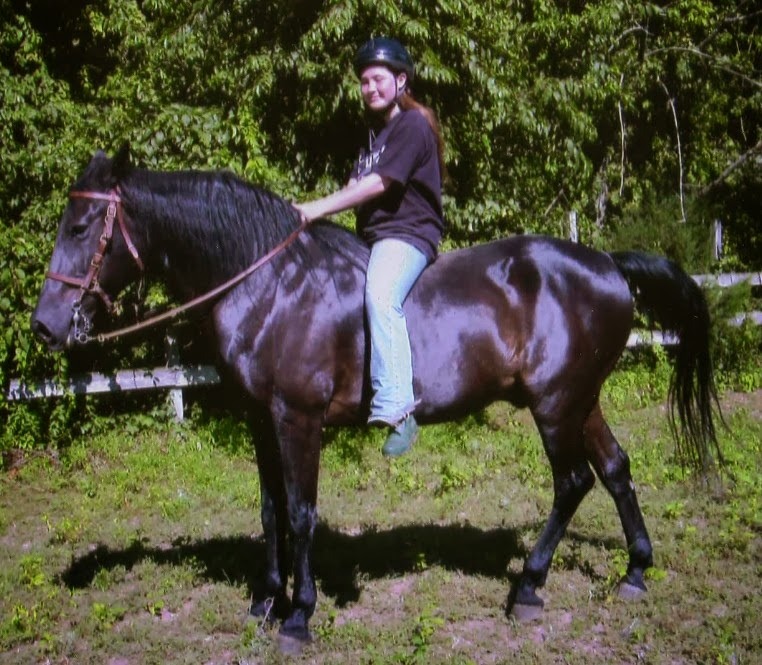 Tank was my first horse. While I've learned more than I can say by volunteering at EOTS owning and living with my own horse really ended up being a crash course in horse care, nutrition and especially training! Before Tank I was a dreamer. I read every book on natural horse training, communicating clearly with your horse, speaking their language. Wow it was different with a real horse! 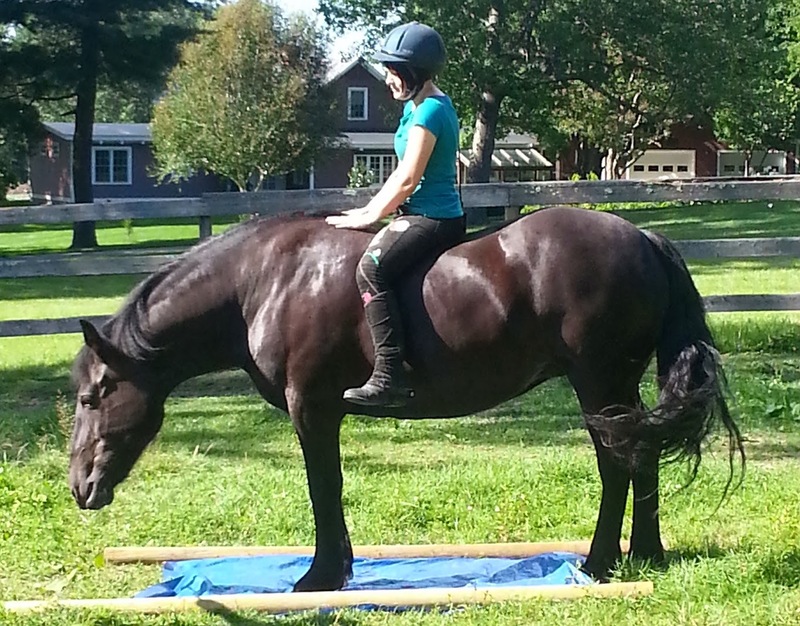 While Tank progressed slow and steady with the basics she had some glaringly obvious issues we needed to work on. The most obvious was her fear. She was afraid of the world – and wouldn't leave whatever spot she decided was her safe spot, her stall and paddock. Another big issue was that when she was overwhelmed, frightened or confused she would run away to her safe place – and there was nothing you could do to stop her. When this began my heart was broken. I had always dreamed of training and riding my own horse, of having that magical relationship you hear of with everyone else. Why couldn't we make this work?! I was so frustrated – then I realized, so was she. I needed to find a way to communicate with her that was clear and left no room for confusion or questioning. I needed to find a way to work with her that was based on her wanting to do what I ask, because there is no amount of force I can use to make her do what I want, if she doesn't also want to. I can't out muscle her, I need to outsmart her, I needed to make her think that doing what I asked was the best thing ever. With nothing left to loose I experimented with a training style I had heard of on the internet. I found a few good videos on how to gets started – and I tried it. And it worked. It worked fast! The training style is based on Positive Reinforcement (reward based training). I started by teaching her just to stand still and face forward – setting the president that if she wants her reward she must always be contained and politely respecting my space. At the same time I taught her a bridge signal. This signal can be the click of the clicker or a smoochy sound I make myself, or any unique sound that won't happen by accident. This bridge signal “bridges” the gap between the action the horse performs and the reward that will follow. The “bridge” signal buys me time to get her reward and enables me to mark behaviors that I can't be rewarding while they're in progress (jumping or lunging for example). Once I taught her how to be respectful of my space for her reward and what the bridge signal means – I taught her to target. I held out a crop and when she touched it with her nose she got her bridge+reward. I used the target to teach pretty much everything else from here on out! She's learned to lunge at liberty (in a full paddock, forming an even circle around me – not a round pen), to lead at liberty over and around obstacles, to give to pressure and some other simple tricks. I also spent a great deal of time “counter conditioning” her to objects that frighten her. I started with simple things, plastic bags, plastic bottles with noisy things inside – I would make these objects come alive and reward when she showed signs of calmness or curiosity. Soon she began to realize all these silly objects Mom came with wonderful things. She soon loved whatever I could throw at her – she reaches to touch objects she's never seen before. I like to explain to people that when I got my Tank she was a “shoot first, ask questions later” type of girl – she'd spook and explode at anything that could, maybe, be a threat. But now she's gained so much confidence, she's beginning to “ask questions” first, she's beginning to let curiosity win out over fear. I have continued to learn more and more about the training style, learning more about the science and the art of how to train using Positive Reinforcement. I handle her almost completely at liberty (without tack) now. The only times she wears tack is in “minimal choice” situations, like for the vet or farrier. She knows in these situations she must comply – but because I've spent so long reinforcing these behaviors at liberty – it takes the stress away from when she has no choice over the situation. Because I work with her mostly without tack, I am forced to listen to her, understand how she's feeling and working around her feelings that day – I'm forced to train her at her speed. It leaves me without a choice but to work as a leader and partner – rather than a boss. I have never felt such a partnership with a horse before as when my horse has complete choice whether or not to work for me, and knowing that as a fair leader I'm rewarding her and making the experience something she enjoys as much as I do. I have found my partner in Tank. Since I've found how wonderful this is, how easy to understand and how happy and eager horses become with this training style I've begun to try it with the horses at the rescue. The young volunteers have practiced it with their horses and have learned how to trust their favorite horses. They've learned they don't need to use tools, force or pain to control their animal – but instead how to work in partnership with their friend. They have each picked their favorites to work with – I love watching their relationships grow and their goals change and expand as they get better and better. If you follow our facebook you'll be sure to see lots of pictures and videos of the girls working with their favorite horses. I realized today that I have been taking care of some of the Eye of the Storm horses for ten years now! That's a long time to have known, loved and cared for anyone. Junebug was one who was there from the beginning. She is everyone's “first” at EOTS. Whenever we had a new volunteer, Junebug was the first for them to lead in or out, the first for them to groom, the first for them to fall in love with. Whenever Junebug walked by we had an on-going joke of “watch out! She's fast!” and “she's a wild one – hold onto her tight!” - Junebug did NOT find this as funny as we did! Regardless of whether a new volunteer was leading her or if we just left the gate open for her, she would teeter her way into the barn, grabbing a bite or two on her way in of whatever goody she could find. Despite her physical difficulties Junebug had a very important mission at Eye of the Storm, not just in comforting our horses who are reaching their final days, but also in welcoming and teaching our new volunteers. While she wasn't the biggest fan of children – she knew it was her job to take care of them. There was one day we had an entire girl scout troop come in to meet the horses, Junebug was volunteered to be their grooming project (she is well known for her extreme shedding!). Buggy stood like a stone while 5-10 girls climbed all around her, combing and currying and brushing every inch of her tiny self. She was eternally patient. When she was done she politely put her head against me (as I held her) and told me she was ready to go back to her stall. At Eye of the Storm we don't ask much of our horses – and usually, when we do need something from them they are happy to oblige, especially Buggy. We will all miss her. All dolled up by the girls! Hello! I am Jessica, a life-long volunteer at Eye of the Storm. I've popped up a few times on this blog, and if you follow our facebook page (which you should!) I'm the one always posting all those pictures of the horses. I've been volunteering at Eye of the Storm since I was 14 years old, being 24 now – that's a whopping TEN years! Wow the time flies. I started as just a horse loving kid who wanted more out of a relationship with a horse than just once a week riding for half an hour. At Eye of the Storm I discovered how intelligent and kind horses are. Having few human friends in my childhood, the horses here become my rocks, Solomon and Noogie in particular. Solomon showed me the ropes of Eye of the Storm. He taught me how to speak “horse”. He is as mild and kind as a horse can get, but due to his past he has some sore spots. He taught me where he liked to be scratched and where I should never touch. He taught me about how the herd works – he was the lead gelding of his herd of mares, at the time he had Nessa, Snowdrop, Junebug and Bianca. He taught me how he protected his mares, but he also taught me that Nessa was really the one in charge. He did the guarding – but she kept everyone in line. I've watched through the years as his herd dwindled, I've seen his sadness when he lost his beloved Snow Drop. He loved her so much – it wasn't much reciprocated, but he protected her and worried when she was away. He taught me what love looked like in it's purest form. He is my friend still today, while he's grown old and I've gotten my own horses – I watch him still as he takes care of the new volunteers and takes care of the girls who are just like I was – teaching them what horses really are. I rode Solomon only 2 or 3 times in our time together, he wasn't sound very often. I remember each time and loved every moment of it. Being given permission to ride by Nina is a badge of honor here, it means she trusts us to do right by the horses. It means she believes our relationship with the horse is strong enough to be safe. And we were safe, Solomon took great care of me. The first time was just in the ring we walked and gaited and had tons of fun. Riding him was like riding a couch! But riding him taught me to pay attention to what he was telling me. I started to see when he said he was uncomfortable and it was time to stop. I started to know when it was time to play, when he was bored or excited. We even got to go on one glorious trail ride! We rode through the woods and encountered some dirt bikers who had dug a jump for their bikes – my loyal steed Solomon carried me past those bikes and we flew over the jump together! I have taken lessons for years, jumped and ridden several horses – but nothing compared to that feeling. He was pretty sore and uncomfortable the next day, we decided that would be our last trail. But I think we both thought it was pretty worth it! I love him even still today, he's the first grizzled old face I see when I enter the barn and the last nose to kiss good night to. His herd is down to just one, Bianca, but he still does his job and protects her. Solomon has taught me to speak horse. Eye of the Storm has been so much for me. I've learned to speak horse, I've learned that horses are so much more than something to ride on, the horses are each worth so much more than what they can do for us. The horses at Eye of the Storm can't do much for us, and we don't ask much of them – but they gave me what I needed most, friends and a safe haven. I've learned too about health and nutrition and about how even something as simple as what we eat can greatly affect how we feel and think! If we balanced our diets as well as we balanced our horses, with the herbs and supplements we'd all feel so great! I've been at EOTS through surgeries and vet care, I've helped wash Rose's hives and held Viking's head during his gelding, and Czardas's head during her canker removal. I've learned the goods and bads about modern veterinary medicine, the options we as animal caretakers have to keep our animals safe. I've learned about the beginning of life with our two colts, and the end of life with the many we've been there for when it was their time to cross over. Being here has provided me with more opportunities than I can imagine, including a scholarship to college and job opportunities. EOTS has truly shaped my life and will become my future. I fear greatly for racing Thoroughbreds, but we seem to manage to watch the Kentucky Derby each year at the barn. I don't care who wins, but I always pray for them to just make it safely to the finish line without injury. Our tiny TV is in the middle of the barn. Gabriel is our 25 year old stallion was race horse. He won 17 of his races and come in second and third several times. He ran in 98 races. He won a hard earned $100,000 for his owners in that time. He has been away from the track for 18 years. But every time he hears the trumpets at the start of the race, he lifts his head and stares off into the distance with the “look of eagles”. He still remembers. My magnificent silver stallion, “Hail to Thee” was his name, my beautiful old man. It seems all I ever write is sad things. I am sorry. But this is a sad place. Sad that these beautiful, powerful beings come here to live the last of their lives because no one else wants them. It is sad that there is a need for places like Eye of the Storm. It is sad that we are so underfunded, overworked and terrified all the time. It is sad that all I can do is make them comfortable until I have to say goodbye. I ask myself often why did I take on this job? In the beginning I just wanted to make a difference. I guess I have. I guess I am strong enough, stronger than most, but I am tired, just plain tired. I need peace in my heart, a rest from fear, so many lives in my care, where will the money for the next load of hay com from? Every single day I am afraid. What will I find in the morning? When I leave them at night I pray for them, that they will be kept safe until I see them again. I dream about them. I wake up in the night, my heart pounding, from nightmares about them. I am tired. We need money to go on. Thank you all so much for your support. Please help us. I do not have many friends. I am told, by those who dare, how unfriendly I am. Those who do not dare, disappear and never speak to me again. I am some kind of misplaced warrior, who, alone stands before the abyss to keep a barn full of completely broken horses safe, lost ones who were cast aside by their humans long ago. I have stopped worrying about the feelings of humans as even on good days this berserker energy of mine surrounds me and sends humans running – I cannot change who I am, I finally accept that. What that has cost me, no one but myself and God knows. I am old and ugly now, I can't stand looking at myself in the mirror. Junebug has died. For 16 years I have kept her illness at bay. 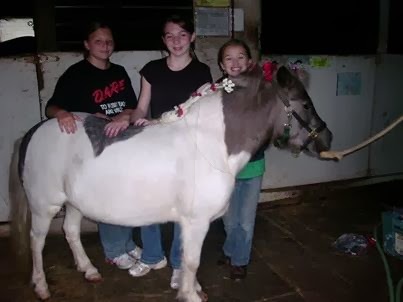 At 6 years old she was morbidly obese with rolls of cellulite fat all over her body with Cushings/insulin resistance, founder in all four hooves. With the help of God Jehovah as I prayed for wisdom, I was able to maintain Junebug and keep her healthy and reasonably pain free for the rest of her life. This year I lost the battle. At 22 years old Junebug is gone. I blamed myself, of course. As I cleaned Faith's stall, I was thinking horrible thoughts about myself, that this job is a fools job. That I have disillusioned myself about how I have any control over anything and how stupid I am to think there is anything “special” about me. Beyond my absolute obsession over the care of a bunch of animals. Who the heck do I think I am? Faith uncharacteristically kept following me around her stall as I cleaned. When I finally stopped moving she wrapped her neck around me and pulled me into her body. She knew what I was thinking and told me I was wrong. I am their person, I belong to them. I acknowledge that horses can't be owned. They choose us. I have been chosen in this small circle of Eye of the Storm, it is I who stands before the abyss. It is I who holds death at bay. Horses die. We all die. When their time is up, I let them pass, but until that moment I will help them live. I am not to blame. They come to me so shattered. Most of them would have died years ago. I love them so much, I expect nothing from them. They would all follow me through fire. I am their leader. And so, I have never fit into the place where “normal” humans dwell. I have mentioned a time or two, it's not enough that I would take a bullet for someone, I have to be nice too? Well, though I try hard, I'll never really be “nice”, not by the standards of the world. Oh well. Coco is very sad about Junebug. As I led her outside for the last time, they both knew. Junebug was exhausted, in terrible pain and just wanted it to be over. She kept asking me to help her get there. Coco reached out and licked her face. Over and over again, she gave her the strength to walk out the door. They each knew they were saying goodbye, they never made a sound, they just knew – and it was ok.
Coco is a little feral horse who does not want to be touched but is obviously grieving. I can only speak quietly around her now and feed her carrots to help her. She appreciates that very much. She is very special, I think Junebug passed the torch to Coco, to be the barn's caregiver to the dying members of EOTS. Something makes it possible for me to go on. When I just want to run away and never come back, when my heart is so broken I can barely breathe, I am still here. I guess there is just no where else for me to go. These horses call me back because I belong to them. And they love me. Get the latest updates and join the discussions!